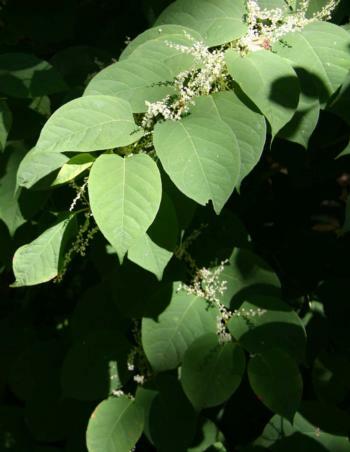 Small patches of knotweed can quickly grow to infest large areas of land in and along waterways (measured in acres) and is known to encroach upon neighbors’ yards. It grows through street pavement, concrete, and other hardscapes, including sidewalks, streets, home foundations, septic systems, and a variety of driveway hardscapes thus negatively affecting property values. Knotweed is an aggressive colonizer that outcompetes native vegetation by emerging early, growing fast, and preventing seedling regeneration. Eventually the lack of canopy or shade-providing vegetation raises the temperature and reduces dissolved oxygen in stream water. Infested areas become unsuitable habitat for native wildlife. One study documented significantly less food for fish in the spring and higher water temperatures due to a loss of canopy. These combined to dramatically reduce the survival of both juvenile and adult salmon. Over time creek banks become more vulnerable to erosion.